Waves are created by temperature-induced thermal expansion/contraction properties in a geomembrane liner. 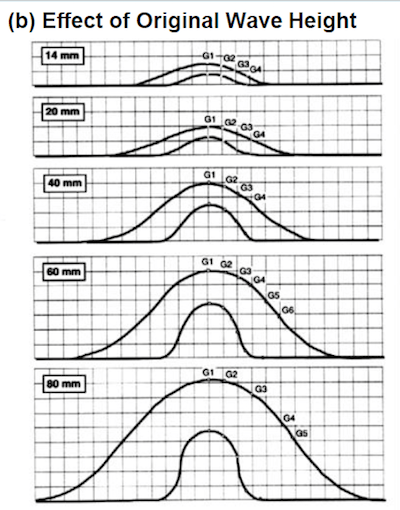 And every geomembrane liner has a different thermal expansion/contraction coefficient as listed in the table below; the higher the coefficient, the higher the expansion/contraction capabilities and the larger the waves. 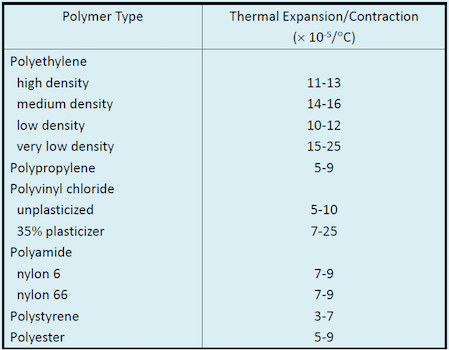 The table also shows how and why polyethylene (HDPE) is well known for its expansion/contraction properties. During his years of research on the topic, Koerner found that thinner, unreinforced geomembranes tend to have many small waves, while thicker and stiffer unreinforced geomembranes tend to have a few large waves. He conducted his research alongside T.Y. Soong, another geosynthetic expert. Together, they created two different test methods that were designed specifically to analyze geomembrane waves. Koerner and Soong concluded that waves never go away after they have already formed no matter how much soil or pressure is placed on top of a geomembrane. It turns out waves create an airtight void that cannot be dissipated or pushed out regardless of the pressure/weight added (this is depicted in the two diagrams below). While placing weight on top of a membrane may not fix a wave or wrinkle, there are actually many cheap but time-consuming ways waves and wrinkles can be fixed, as explained in the below table and bullet points taken from Koerner’s webinar. Push/Accumulate/Cut/Seam Method: This method takes the installed waves and pushes them out with weight from soil and heavy machinery. The geomembrane wave is then cut,overlapped and welded together to create a smooth surface. 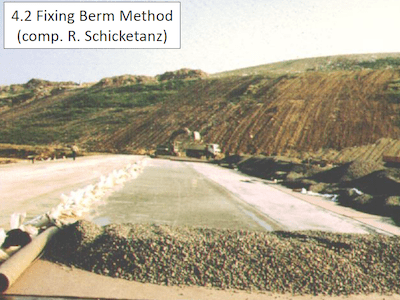 Fixing Berms Method: The HDPE geomembrane is laid down during the hottest point in the day and is pulled tight (still with wrinkles) and pinned down around the perimeter with soil. The liner then sits overnight and contracts due to ambient cold temperatures that pull it tight to provide a smooth surface (thanks to its thermal contraction capabilities). The liner is then covered with soil in the early morning hours before the ambient warm temperatures expand and create wrinkles in the liner. White GM (Unreinforced Geomembrane) or White GT (Geotextile) Covering a Black GM Method: The white geomembrane surfaces collect less heat and therefore don’t expand to the degree non-white material do. Note that his method still doesn’t completely prevent waves. 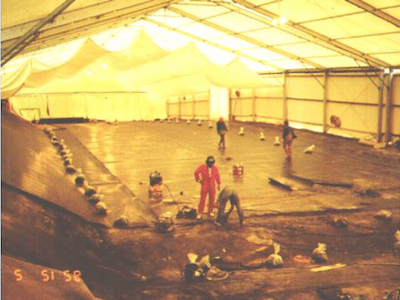 Temporary Tent Method: This method covers the whole geomembrane installation to prevent the sun’s heat from expanding the geomembrane and creating wrinkles. 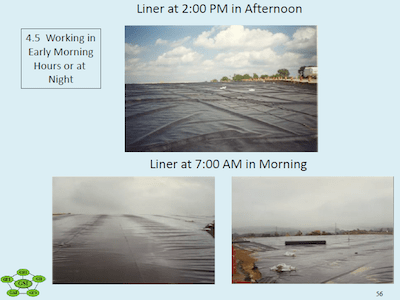 Morning or Night Method: This method calls for installing the geomembrane during the low temperature times of the day to prevent wrinkles. This provides only a small window of opportunity and can be unsafe because the coldest parts of a day usually have low levels of sunlight. One of the more interesting solutions, mentioned above, is the use of a white geotextile or white geomembrane to cover a dark geomembrane. The white surfaces accumulate less heat and lower temperatures to - reduce the number of geomembrane waves or wrinkles, but not getting rid of them completely. The addition of pressure/weight does not fix unreinforced geomembrane waves or wrinkles. Waves and wrinkles can collapse and form creases that lead to cracking. Waves and wrinkles decrease a geomembrane’s life cycle. 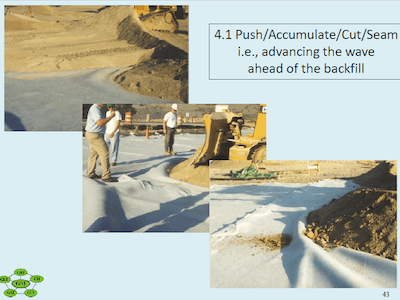 Unreinforced geomembrane installation must be done quickly if a liner is made of a material that is prone to thermal expansion/contraction; and quick installation takes a lot of attention and planning. Fixing a unreinforced geomembrane wave or wrinkle can become time consuming and expensive. 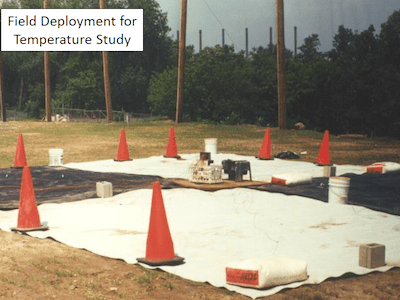 Attendees of Koerner’s webinar noticed every test was done with an unreinforced HDPE geomembrane, leading them to ask why a reinforced geomembrane wasn’t included in the study. 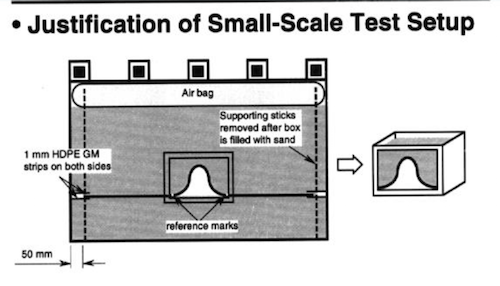 Koerner acknowledged that some attendees believed reinforced geomembranes could provide different results and concluded that he would consider doing the same test on reinforced geomembranes in the future. For another perspective, check out Glen Toepfer’s blog on the same webinar. What are your thoughts on addressing geomembrane waves and wrinkles? Tell us about them in the comments!